We’d love your help. Let us know what’s wrong with this preview of Time Travel in Einstein's Universe by J. Richard Gott III. To ask other readers questions about Time Travel in Einstein's Universe, please sign up. Recommends it for: those into quantum physics. I read this book and I need to re-read it again. This is one of those books that after you read it the first time, you are completely enlightened. You know you probably missed some important details so when you read it a second time, everything you missed pops out at you. For anybody really wanting to understand the different theories behind time travel, this book is for you. There were times when I just sat and pondered about what I just read for about an hour. دعني أخبرك بسر،أنا و أنت و الجميع مسافرون عبر الزمن ،كيف هذا ؟ سأخبرك لاحقا و لكن الأن سوف أشاركك بعض الأفكار المتفرقة عن موضعنا هذا . دعني أتحدث عن الزمن قليلا ، مفهوم البعد الرابع اي الزمن ظهر لاول مرة في رواية آله الزمن عام 1895 علي يد هربرت جورج ويلز ، اي انه ظهر أدبيا أولا ثم تنبنته الفيزياء ، أليس ذلك مشوقا ؟. حسنا دعني أنبهك أن هناك فرقا جوهريا بين البعد الزماني و الابعاد المكانية الثلاثة ، فالبعد الزماني له إشارة سالبة . علم الفيزياء حاليا يعترف بأربع أبعاد محسوسة كما سبق ذكره و لكن هناك من يعتقد بأن هناك بعدين زمانين لا بعد واحد ، و أنا من مؤيدي تلك الفكرة ، فالابوريجنين ×سكان استراليا الاصليون اعتقدوا بوجود بعد زماني أخر و هو ×بعد الحلم× ، نهايك عي انه من الممكن أن نكتشف مستقبيلا ابعاد أخري ربما تكون غير محسوسة . تخيل معي عالما أحادي الابعاد أو ثنائي الابعاد ؟ ساترك شرح هذه النقطة للكتاب فهي مذكورة فيه بأستفاضة . تبعا لنظرية النسبية الخاصة لا يمكن السفر عبر الزمكان للماضي لان ذلك ينافي حقيقة أن سرعة الضوء هي السرعة الوحيدة المطلقة في الكون . العجيب أن نظرية الاوتار الفائقة ×بدون التطرق لها×تقترح وجود 11 بعدا , واحد زماني ، 3 ابعاد مكانية ، 7 ابعاد ملتوية . تتسأل لما أطرح كل هذه الاسئلة ، اطرحها لانها هي البنية الرئيسية التي يترتب عليها نشوء مفهوم السفر عبر الزمن . بعضهم أعترض قائلا ، لا نستطيع أن نقرب جسما من سرعة الضوء ، الم يسمع القائل عن مسرعات الجسيمات العظمي ففي معهد فيرمي تم تسريع البروتونات الي 99,999946 في المائة من سرعة الضوء ، اي أنها حيز الامكان ولكن يكمن العيب في إمكانيتنا في تطبيق هذه العملية علي كتلة كبيرة نسبيا ككتلة الانسان , لم اقنعك ؟ حسنا و إن اخبرتك أن احدهم بالفعل سافر عبر الزمن للمستقبل ؟ رائد الفضاء الروسي سيرجي اندييف قصي 748 يوما في الفضاء و تجاوزت سرعته 17000 ميل في الساعة اي ان تلك السرعة تساوي 0,00254 من سرعة الضوء و لكن بلغ عنها أن عمره تناقص بمقدار 1 علي 50 عن العمر الذي كان سيبلغه علي الارض ، رغم كونها ضئيلة جدا الا انها حقيقة تثبت إمكانية السفر . حسنا تعالي معي نفكر في السفر عبر الزمن للماضي و لكن فكر فيه كأنك تشاهد الماضي لا تزوره ، اتعلم انك إذا راقبت نجم ألفا قنطروس فأنك ما تشاهده هو ماضيه و ليس حاضره فهو يبعد عنا 4 سنوات ضوئية ، و مجرة أندروميدا تبعد عنا ميلوني سنة ضوئية اي ان ما تراه عندما تراقبها هو ماضيها منذ مليوني عام ، ببساطة اي أن التليسكوب أداة زمن . أما زيارة الماضي فهو أكثر تعقيدا فتبعا للنسبية الخاصة هو مستحيل و لكن ظهرت عدة نظريات أخري تسمح بحدوثها ، كطبيعة الزمكان المنحنية ، تقوس الكون ، الاوتار الكونية و غيرها كثير ..
دعنا لا ننسي أن الكثير مما نحن فيه الأن كان في البدء مستحيلا. ستجد فائدة لا مثيل لها فيه . We instinctively know what time travel is, but how would you define it in physical terms? How is time travel to the past different from time travel to the future? And does it fit in our universe? If not, how can we know about the future? Author tries to answer these questions in a graphic way, and he succeeds! The book also takes a suprising turn towards the end, making it an extra satisfying read. I enjoyed this book about the physics of time travel, although at times I felt like the author was dealing with some pretty speculative stuff and presenting it pretty confidently as fact. For instance, he describes a method of creating a "time machine" that would, in theory, allow a spaceship to reach a destination faster than light. To set up the process, you position two cosmic strings of infinite length near each other. Oh, is that all I need? Two cosmic strings of infinite length. Let me chec I enjoyed this book about the physics of time travel, although at times I felt like the author was dealing with some pretty speculative stuff and presenting it pretty confidently as fact. For instance, he describes a method of creating a "time machine" that would, in theory, allow a spaceship to reach a destination faster than light. To set up the process, you position two cosmic strings of infinite length near each other. Oh, is that all I need? Two cosmic strings of infinite length. Let me check in the basement for those. Meanwhile, I will continue with my money making plan of finding a magical goblin that craps Fabergé eggs. In another section of the book, there is a lengthy discussion about predicting the duration of things (like lives, or civilizations, or planets) based on probability and the idea that we're not at some "special" point in time (like the Copernican view that Earth doesn't occupy a "special" place in the cosmos). This method allows the author to predict that, for example, the United States is likely to exist for a duration of somewhere between 5.7 years and 8736 years. The ultimate point of describing this method of predicting the future is to exhort people to invest resources into the space program, with the goal in mind of colonizing space, in order to increase the likelihood of the survival of humanity. This point I tend to agree with, although the "Copernican" method of predicting the future seems kinda sketchy. Professor Gott starts with the familiar paradox of a time traveler going back and killing a grandparent, adds Einstein's general theory of relativity, and walks the reader through much of current physics theory while seeking ways time travel might be permitted. Along the way, he manages to use almost no mathematics through a set of simple, expressive diagrams. An excellent popular science book! Great book. Perfect starter book to anyone interested in time travel. It posits many of the theories and paradoxes of time travel while being quite informative. The book may be tough for some readers if not of a science background, but it has excellent metaphors that help the reader along. Un librito muy interesante que ofrece mucho más de lo que esperaba y te deja con ganas de más. "It is the time traveler's secret"
This was one of those books I thought I'd never read. I don't even recall why I started it. I mean, the idea of time travel intrigues me, sure (Thank you, Doctor). But I didn't expect it to be a good read. Get it? Well, unlike that tragically executed pun, this book was awesome. It's just so timey wimey and incredibly explained. You don't need to know rocket science or quantum mechanics to understand what JR Gott is saying. However, if you're going to get into thi "It is the time traveler's secret"
However, if you're going to get into this then you better be prepared. You're gonna need pencils, paper, scissors, glue and string. Yeah. STRING. STRAAAAAAAINGG. It's really kind of cool how time travel does seem possible, but what's even cooler is how a guy with a degree in astrophysics managed to dumb it down enough for me to understand while making it a snooze-fest. One of the two best non-fiction books I have ever read. Read it several years ago and it continues to influence my thinking. This book touched me not just intellectually, but surprisingly spiritually as well. It is one of two books I always recommend for anyone seeking a higher understanding and connection with the eternal. There truly can be a spiritual aspect to science. I had a bit of a difficult time reading this book, as I had to concentrate way too much. Hey, I’m no Einstein. But I do love time travel, so I stuck with it to the end and was rewarded with lots of interesting bits how time travel may be possible, about the Big Bang, the creation of the universe and the Copernican principle. Science rocks! This was a good read. I am not a physicist, but I was able to understand Gott's arguments well, so in that respect it was a good book, but, there were a number of formatting and spelling errors that made the reading a bit tedious in parts. If you're interested in the physics of time, then it's worth the money. A really nice quirky overview on the possibilities of time travel from a physicist's point of view and a little history of science thrown in as well. I found it engaging and fun and easy to read and wished it would have been more in some places and less in others. If you've read Kip Thorne's books on time travel (and black holes) and enjoyed them, you'll like this one, too. Interesante libro donde de una manera lo más científica posible se intenta demostrar gracias a las teorías de Einstein que el viaje en el tiempo es posible. Tiene conceptos curiosos y realmente da que pensar en que el viaje en el tiempo es posible. I had thought the book would provide interesting insight into the possibilities of time travel, which it did in a sort, but seemed to get lost in a lot of detail that made it difficult to get through. Uzay zaman hakkında bakış açımı geliştiren bir kitap oldu. Anlatımı başlangıçta sade ilerledikçe orta seviye fizik bilgisi gerektiriyor. My absolute favourite science/physics book. Very involved but extremely informative. I still refer to this many years later. I took upon reading this book as a mental challenge and it was a challenge alright! First, I'd like to say that I have always been a huge fan of Einstein's work, however, this book convinces me that he was not just a genius but one who was determined to follow his inspiration. 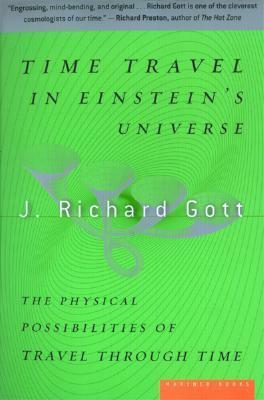 Gott explains into detail Einstein's three biggest ideas/theories and how they contribute to the possibility of time travel - past and future. I can imagine there'd be a few critics out there dismissing the theories in thi I took upon reading this book as a mental challenge and it was a challenge alright! First, I'd like to say that I have always been a huge fan of Einstein's work, however, this book convinces me that he was not just a genius but one who was determined to follow his inspiration. Gott explains into detail Einstein's three biggest ideas/theories and how they contribute to the possibility of time travel - past and future. I can imagine there'd be a few critics out there dismissing the theories in this book as mere speculations. I don't blame them but I cannot agree with them. Gott makes it clear time and time again, that travel through time is not a physical possibility since no matter is known to exceed the speed of light (he discusses in detail why using Einstein's theories). In saying that, he discusses a few possibilities such as wormholes, warpdrives, blackholes & quantum tunnelling of small universes. I agree that almost all of the possibilities seem farfetched such as finding a wormhole or cosmic strings of infinite length, however, this is exactly why Gott tells us that time travel is almost impossible in OUR time. Suffice to say, the content of this book makes one wonder about how insignificant we - Earth - are in the whole universe (maybe multiverse). I thoroughly enjoyed the last two chapters that dealt with the big question: how was the universe created? I don't want to spoil it for other readers but Gott's answer is definitely worth a thought (maybe many!). What ages would I recommend it too? – Fourteen and up. Length? – Several days to read. Setting? – Semi real world. Science on the scale of the largest and smallest particles. Does the story leave questions in the readers mind? – Reading to read more theories. Short storyline: The first chapter was really good and covers many types of media (books and movies) that give examples What ages would I recommend it too? – Fourteen and up. Short storyline: The first chapter was really good and covers many types of media (books and movies) that give examples of time travel. The second chapter talks about the possibility of time travel to the future. The third chapter pretty much decided that time travel to the past, other than within a person's own lifetime is nigh impossible, and even then, the likelihood of time travel to your own past is almost impossible. There is a lot of repetition. Some sentences are repeated dozens of times. The last chapter spouts about a future prediction theory. It could have been summed up quite well in three pages. Basically, if it has happened, it will happen. The numbers it comes up with are so unrealistic, that it's unbelievable. No individual human could live 1,250 years and still be healthy. In some ways, this theory might be useful for giant calculations - like predicting the demise of the universe. And yet, even then, the numbers seem too large to be meaningful, and are often contradicted by other science (much as theories often are). This review has been hidden because it contains spoilers. To view it, click here. I picked up this book because I like to hear all of the theories and concepts behind them. The book starts off with talking about the grandmother paradox and gives reference to how Hollywood has used this in a few movies (ex. Back to the Future, Groundhog Day). Gott also talks about theories behind the creation of the universe and how the universe could create itself. He then ends with the 50 and 95 percent certainty principle. I love this book because of how easy it was to read and understand wi I picked up this book because I like to hear all of the theories and concepts behind them. I love this book because of how easy it was to read and understand with very little things i needed to go online and look up.it was a good read overall and doesn't take to long to get into. I can't say I understood it all. But for explaining extremely complicated concepts to a layperson, Gott did fabulously. This book also deals with such fun as the beginning of the universe. The whole "universe created itself" concept is excellent. It sounds like time travel is theoretically possible, but we're going to have to get a LOT better at space travel first. Also, no tr I can't say I understood it all. But for explaining extremely complicated concepts to a layperson, Gott did fabulously. This book also deals with such fun as the beginning of the universe. The whole "universe created itself" concept is excellent. It sounds like time travel is theoretically possible, but we're going to have to get a LOT better at space travel first. Also, no traveling back in time until someone builds a "time machine." Boo. This started off as a fascinating read however I am going to have to put it to one side for the time being. Despite being billed as for the lay reader the scienctific writing was very detailed and way beyond my grade D GCSE science. An interesting survey of time travel in film though. Whoever it was who told me that Bill and Ted's excellent adventure was about a road trip round America clearly had never actually seen it. The first few chapters were incredibly interesting in that they actually went through various time travel possibilities and explained various paradoxes. Then the book took a long time to go through a physics overview about string theory, laws of motion, and higher dimensions that has been done better in other books and didn't really talk about time travel. The last chapter or so got back on track but I wish the book just stuck to time travel theory. John Richard Gott III is a professor of astrophysical sciences at Princeton University. He is known for developing and advocating two cosmological theories with the flavour of science fiction: Time travel and the Doomsday argument.